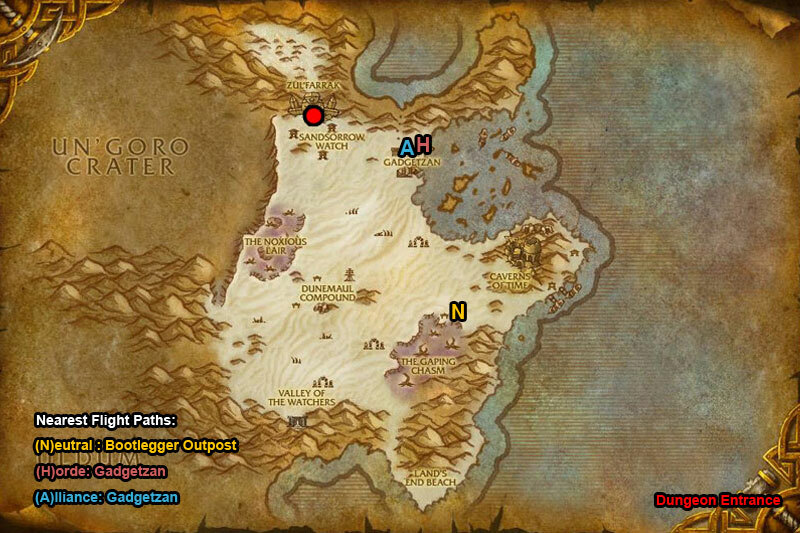 You can find the Zul’Farrak dungeon within Tanaris, Kalimdor. For boss 4 go up big stairs & open cages to free prisoners. Fight down the steps until bosses appear. When it’s over speak to Goblin who blows the door. If you want speak with Sergeant Bly to start a fight. To summon Gahz’rilla hit the Gong of Zul’Farrak located next to the pool. /i Careful of using aoe by all the Scarabs. Interrupt Fevered Plague. At 30% transforms making him immune to physical & shadow damage. /i Kill the Sul’lithuz Broodling adds first. Kill the Greater Healing Ward & Earthgrab Totems. Boss uses variety of shaman spells. At 75% & 25% summons servants to fight, kill them quickly. /i Raises zombies from nearby graves. Kill the Ward of Zum’rah totem before it summons adds. Can interrupt Healing Wave, Shadow Bolt & Shadow Bolt Volley. /i The prisoners help you fight the trolls & bosses. Nekrum: Interrupt Fevered Plague. Sezz’ziz: Can interrupt Shadow Bolt, Renew & Heal. Psychic Scream causes nearby players to flee. /i Patrols around. Interrupt Healing Wave & Water Bolt. Avoid the blue wave (frontal cone). /i Shoots Icicle which slows players movement speed. Freezes players with Freeze Solid. Move away from his slam. /i Boss fights with Ruuzlu. Inflicts physical damage to players in front & nearest targets. Frenzy increases his attack speed by 60%.